Nothing refreshes more than a good night's sleep. If your bed is uncomfortable, how will you ever feel refreshed? Mattress overlays or mattress toppers are hardly a new concept and range from an ordinary sheet of polyfoam to sizable inflatable objects resembling rafts. The different designs, of course, are intended to address specific issues. At Oregon Aero, we built our business around comfort and safety and that was our focus in developing the Low-G® Mattress Overlay. 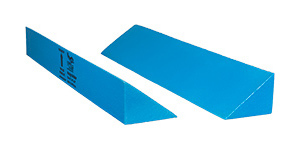 The Low-G consists of a proprietary foam core covered in a flexible skin-like membrane. This skin prevents moisture and bacteria from penetrating the surface of the overlay. Strategically placed vents on the edge surfaces allow the overlay to breathe and not trap body heat. Overlay conforms to the shape of the occupant and promotes overall comfort for persons who are incapacitated or lay in the same position for long periods of time. The Low-G also serves as an effective barrier preventing moisture and sweat from contaminating the existing mattress. The surfaces of the Low-G are durable and can be sanitized with ordinary bleach-based cleaning products. Overlay is available in sizes to fit standard hospital beds and can be used in conjunction with ordinary bedding. Recommended for all occupants up to 350 lbs. For heavier use, two Low-G mattress overlays may be stacked together. Not intended for use on hard surfaces.